I am leading a worship experience this Wednesday titled Stencilling the Spirit in the world. Inspirational spark via Jonny Baker. I need prayers and words and images that speak of the Spirit in the world. Any help will be gratefully acknowledged. NB: Chalk washes off in water. Steve – is there a way to stencil the world that leaves the world clean and fallow as on a sabbath? Is there a way that our cleaning grime or graffiti would count as stenciling something new and/or stencilling our own imprint on that space? Is cleanness a kind of stencil brought by the spirit? Random thoughts. I don’t really understand stencilling, after reading Jonny’s blog. Very interesting idea though! I like Jeff’s idea. 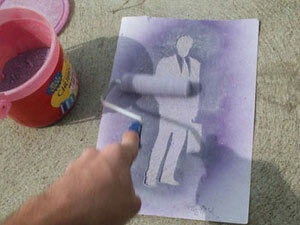 Instead of stencilling with paint or ink, stencil with a solvent – or stencil with coloured light. And if you ask me about the Spirit in the world you’ll probably always get “viriditas” – the greening power of God in the world – thrown in somewhere. stephen and jeff – chalk washes off in water. I was imagining, for instance, a man standing in a grimy city who puts his hand on a stoop — and when he lifts his hand the stoop underneath has a handprint that is clean and luminous– as though his touch has lifted away grime and sin (this could be simulated with white chalk stencil). It would be “such as no launderer on earth can whiten [it]” Mark 8:3. A cleanness that spills out of the renewed world. Viriditas would be so great too! Exactly! Like pouring acid over the stencil and the underlying paint, posters, graffiti etc. being eaten away leaving the original surface. Some images/stencils you’d want to superimpose over the everyday – others you’d want to draw attention to what’s underneath the everyday.